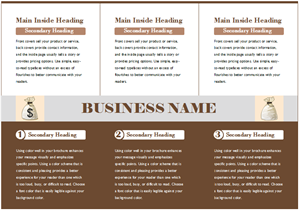 Creating leaflet with free templates and examples. Leaflet design has never been easier. A leaflet is a printed paper document used for advertising products or for an awareness campaign for some cause or event. It usually has to have a design that contains the charm that will catch the attention as well as the interest of its target audience. It's a cost-effective way to tell others about your business. With Edraw leaflet software, anyone without any leaflet design skills can still make stunning leaflets, all in just a few clicks and a couple of minutes. Simply open a ready-made template, replace with your own text and images, and add the finishing touches. 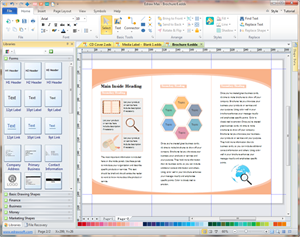 You can lay out and rearrange the format easily with the help of align buttons and smart guides. When you finish creating your leaflet, you can easily export it to PS, EPS or PDF format, and print instantly. 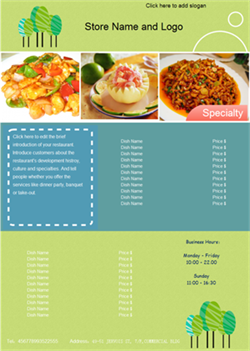 We have chosen an exquisite product leaflet example for your reference. Click the picture to download and modify for your own use. 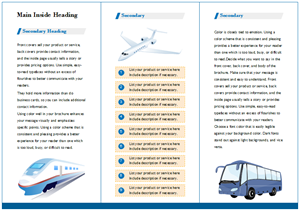 A company leaflet example is readily available in vector format. Anyone could download and use for your own designs. Consider this example when you make your own food menu. It lets you quickly finish your design work and enhance your work efficiency.